All the pieces are falling into place for an upgrade of Kingston’s sewage-treatment plant to produce high-quality reclaimed water for irrigation, stream restoration and groundwater recharge. By the end of this year, a study by Brown and Caldwell engineers is expected to spell out the location and size of pipelines, ponds and infiltration basins. The next step will be the final design followed by construction. When the project is complete, Kingston’s entire flow of wastewater will be cleaned up to Class A drinking water standards. During the summer, the water will be sold to the Suquamish Tribe for irrigating White Horse Golf Course. During the winter, most of the flow will drain into the ground through shallow underground pipes. Some of the infiltrated water will make its way to nearby Grover’s Creek, boosting streamflows and improving water quality in the degraded salmon stream. Another major benefit of the project will be the elimination of 42 million gallons of sewage effluent per year — including about 3,000 pounds of nitrogen — which gets dumped into Kingston’s Appletree Cove. I wrote about the effects of nitrogen and what is being done to save Olympia’s Budd Inlet in five stories published this week in the Encyclopedia of Puget Sound, as I described in Water Ways on Thursday. The Kingston project, estimated to cost $8 million, has been under study for several years, and Kitsap County Commissioner Rob Gelder said he’s pleased to see the effort coming together. The Kitsap Peninsula is essentially an island where the residents get 80 percent of their drinking water from wells. 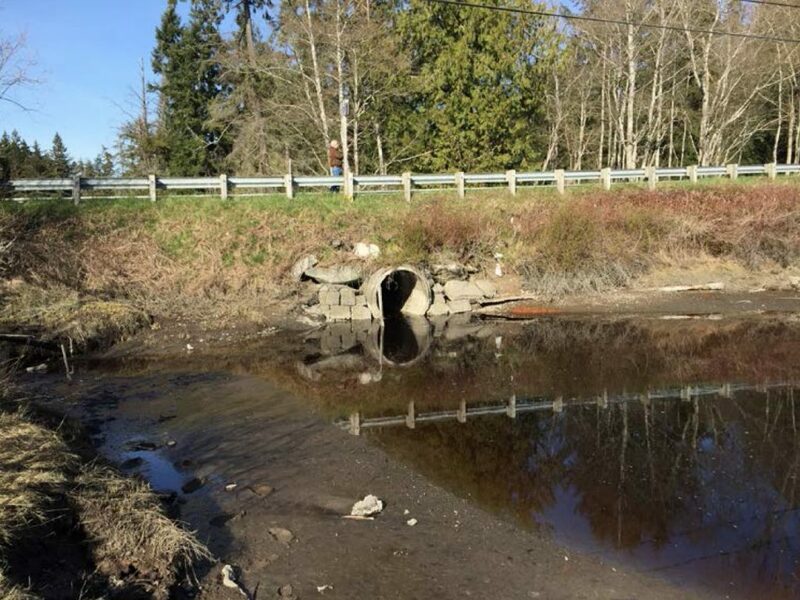 North Kitsap, including Kingston, could be the first area on the peninsula to face a shortage of water and saltwater intrusion — which is why new strategies like recycled wastewater are so important. The latest feasibility study was launched last October under a $563,000 contract with Brown and Caldwell. The work includes a detailed study of soils and analysis of infiltration rates, according to Barbara Zaroff of Kitsap Public Works who has been coordinating the project. The location of the pipeline and ponds for storing water near White Horse Golf Course also will be determined. Funding for the study includes a $150,000 grant from the U.S. Bureau of Reclamation with $150,000 from the Suquamish Tribe. Kitsap County recently received a loan for up to $558,000 to support the study. 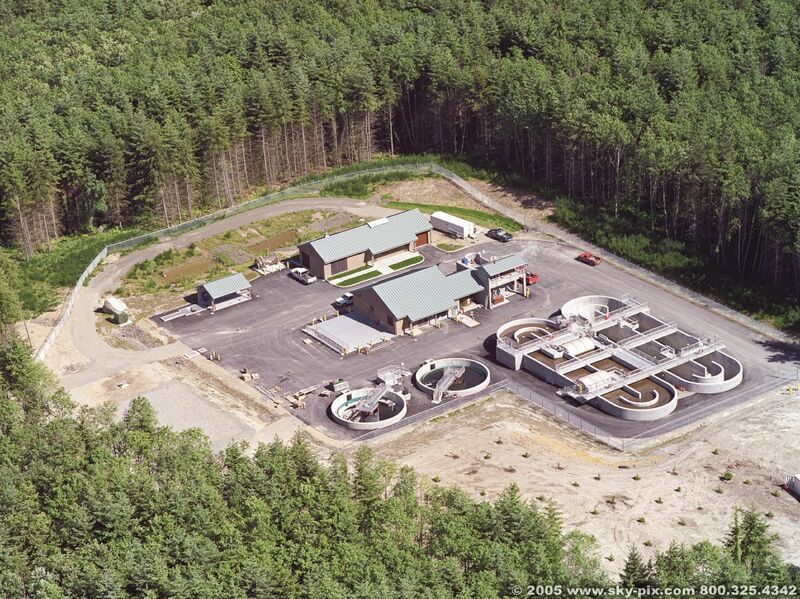 I last wrote about the Kingston Recycled Water Project in Water Ways three years ago, when I also discussed a similar project in Silverdale, where recycled water will come from the Central Kitsap Wastewater Treatment Plant. The bridge construction will continue beyond the end of the year, when it was originally scheduled for completion. The new completion date is listed as March 2018. An old five-foot culvert where Carpenter Creek passes under West Kingston Road is now down to its last bit of concrete plus a wedge dirt, with final removal awaiting completion of a new 150-foot-long bridge. Massive amounts of earthen fill and have been removed since the project started about six months ago. All that remains is the wedge of dirt that still supports pipes and utilities, which will be attached to the bridge during construction. 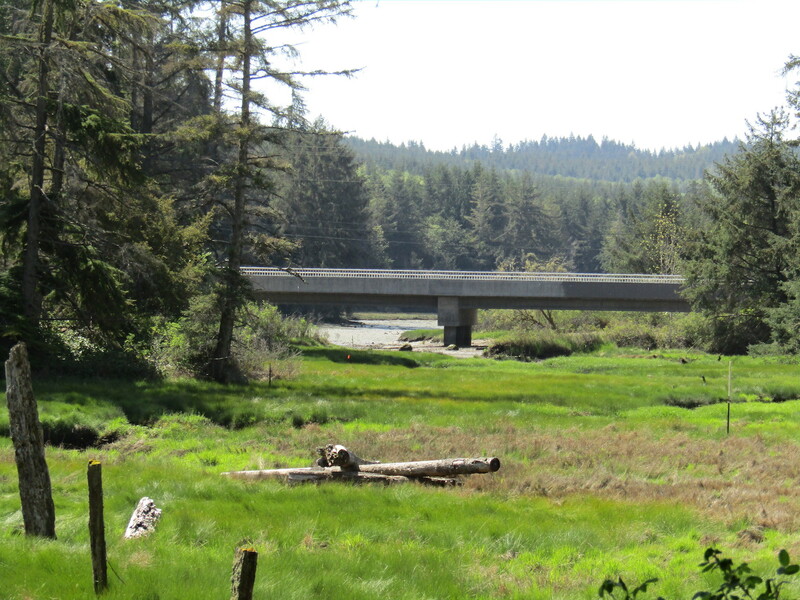 After that, the last fill material will be removed, leaving a wide-open estuary flowing under the bridge. 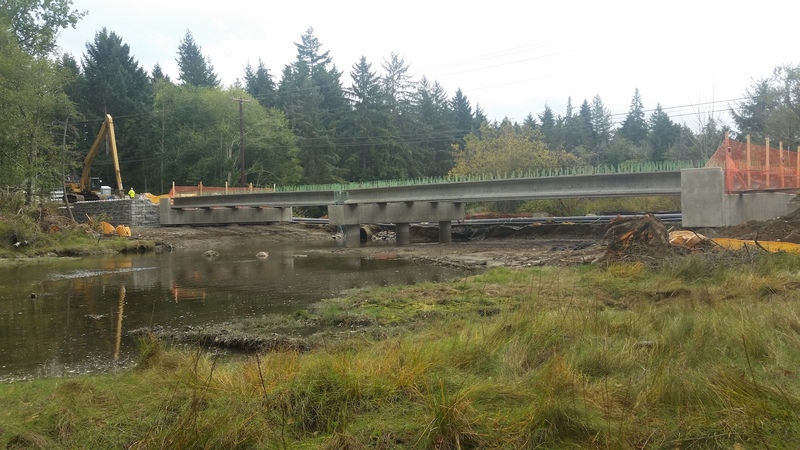 The construction has created some inconvenience for folks in the Kingston area, but the project promises to enhance salmon migration in Carpenter Creek, restore tidal function in the estuary and enhance the salt marsh for a variety of creatures. The creek and/or the estuary may be used by chum, coho and chinook salmon, along with steelhead and cutthroat trout. Stillwaters Environmental Center is coordinating monitoring in the estuary to measure improvements in the ecosystem. Before and after elevation measurements will help describe the physical changes, while biological surveys identify changes in water quality, vegetation, fish and insect populations, among other things. I am particularly interested in how the new bridge will further improve the function of the estuary, which is the last major stop-over point for juvenile salmon on their way out of Puget Sound, according to biologists. The bridge on West Kingston Road is the second phase of a project that began in 2012, when a small box culvert was replaced with a 90-foot-long bridge on South Kingston Road. The first bridge crosses the lower estuary, while the new bridge crosses the upper estuary. While my focus has been on life in the estuary, the project goes beyond the ecosystem, Kitsap County Commissioner Rob Gelder told Kitsap Sun reporter (now retired) Ed Friedrich in a story published in March at the beginning of construction. 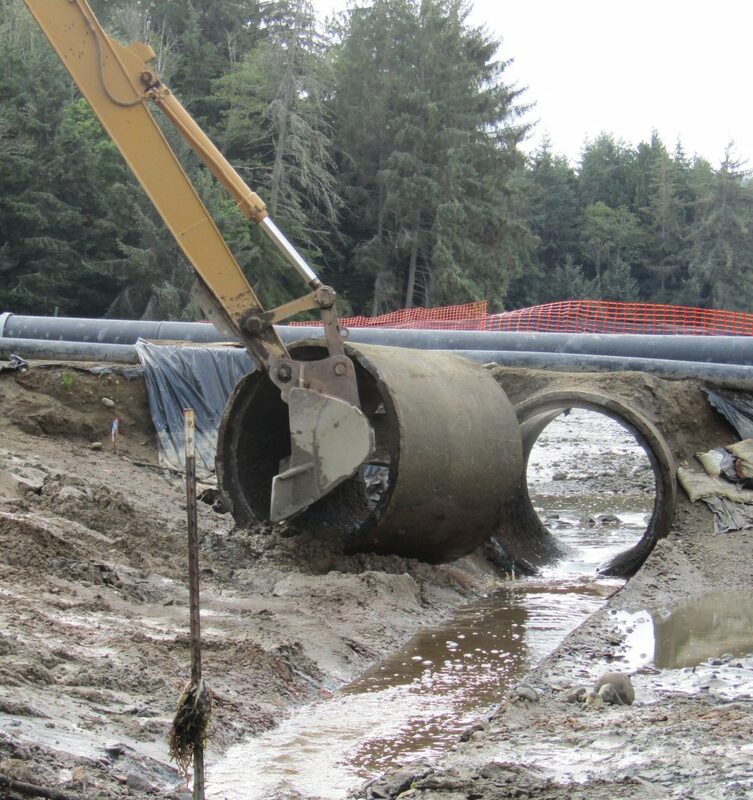 Here’s what the old culvert looked like before the recent project began. Photo: Kitsap County Public Works. The work involves widening the travel lanes, adding 5-foot pedestrian and bike lanes on the north side and a 6-foot paved shoulder on the south side. In addition, street lighting will be added. As of today, the project has fallen behind schedule, according to Tina Nelson, senior program manager for Kitsap County Public Works. Tina said she hopes the contractor, Redside Construction of Bainbridge Island, will catch up enough to allow the road to reopen by the end of December, as originally scheduled. Officials will be assessing the situation through the end of October, she said. If it appears the bridge and roadway won’t be ready for opening by Dec. 31, then an announcement will be made in late October or early November. Advance notice is needed because of school bus routing and scheduling after the new year. The causes of the delay are many, Tina told me, but it generally boils down to scheduling of project materials and crews, for which the contractor is responsible. The contract calls for the work to be done in a certain number of days, she said, and the contractor will lose money if the work is not completed on time. So far, fish passage has not been an issue, although chum salmon could soon move into the estuary — if they haven’t already — as they begin their fall migration. If fish try to move upstream before the channel is reopened, officials with the Washington Department of Fish and Wildlife will help determine the best way to safely get them upstream. Much of the $3-million project is funded by the Navy as mitigation for ecological damage caused by the 2012 renovation of Pier B at Naval Base Kitsap-Bremerton. Rainfall in much of North Kitsap has been falling at record rates since the beginning of the so-called water year, which begins in October. If you live in Kingston, January’s rainfall is running well above records kept since 1993 by the Kitsap Public Utility District. For the month of January, 9.4 inches has fallen in Kingston so far. 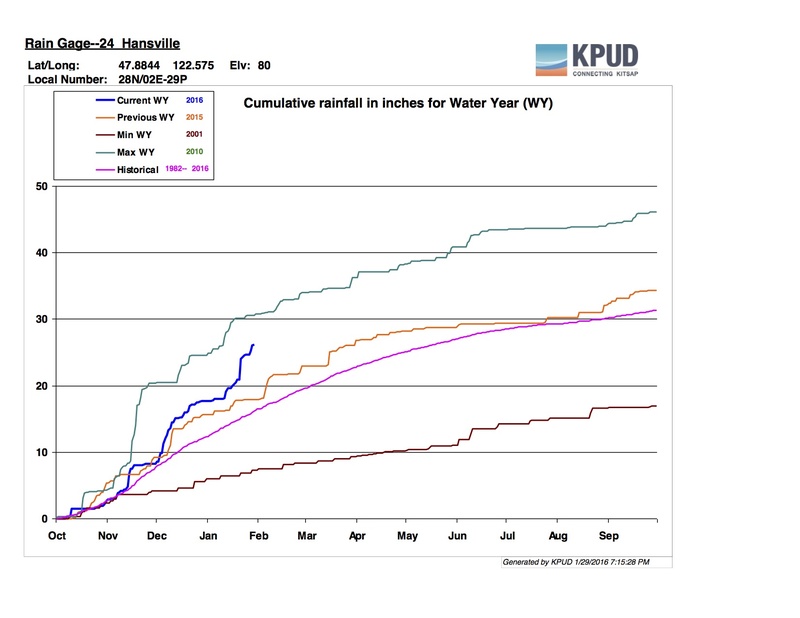 That is more rainfall this January than during any January in the 23-year record. The previous high in Kingston for the month of January was 8.3 inches in 2006. As you can see from the chart, this year’s rainfall in Kingston (blue line) was tracking slightly above the record until early December, when it took off at a higher rate. January burst forth at an even higher rate. The pattern was similar for Hansville to the north, where rains have been falling hard. Extremely high rainfall in November of 2010 established a record for that year that will be difficult to beat in our northernmost community. So far this year, Poulsbo (KPUD office) has been tracking the maximum water year fairly closely since October. 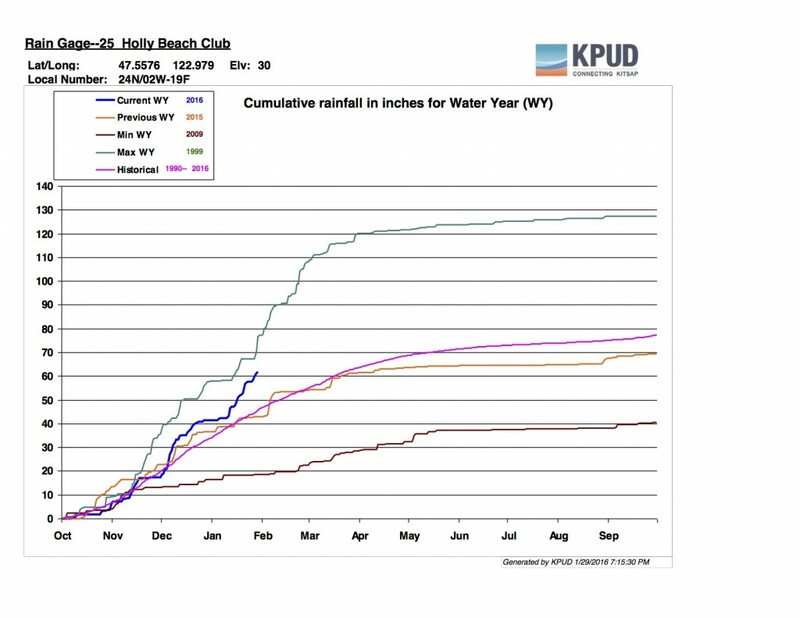 January 2016 is the wettest recorded at this site. So far in January, it has recorded 11.6 inches. The previous high, 11.2 inches, was recorded in 1998. Thanks to Mark Morgan at the PUD for this analysis. Central Kitsap near Bremerton caught up with the maximum water year this past week. And Holly lags behind the maximum water year of 1999 but well above the 26-year average. 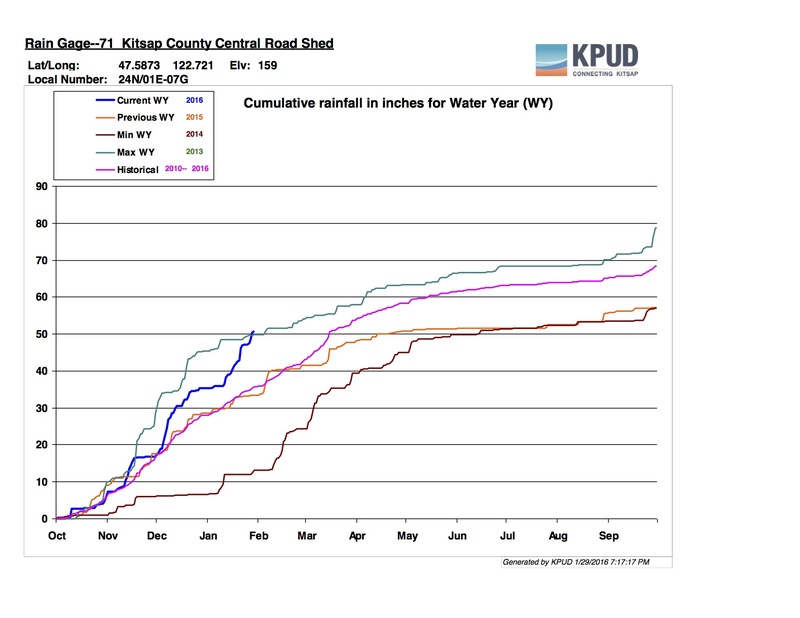 If you haven’t noticed, the Kitsap Peninsula is a rather strange place for measuring the rain. Historically the northern tip gets about half the annual rainfall as the southwest part. For the Pacific region as a whole. the well-publicized El Niño effect has grown stronger, becoming one of the strongest El Niño years since at least the 1950s. But that is about to change. Based on sea surface temperatures, we have just passed the peak of the El Niño, and most models suggest that ocean conditions will transition to a neutral pattern by summer. See El Niño forecast graph and the narrative by the Climate Prediction Center (PDF 707 kb). According to predictions, temperatures should remain above average for at least the next three months. Meanwhile, precipitation is expected to continue above average for the next week or so, decline to average in about a month, then remain below average until at least the first part of May. For a quick look at this graphically, check out the interactive display. Meanwhile, as the Northwest and Great Lakes regions experience drier than average conditions over the next few months, California and the Southwest states, along with Florida and the Gulf states, will see above-average rainfall. The following video describes the current El Niño conditions.